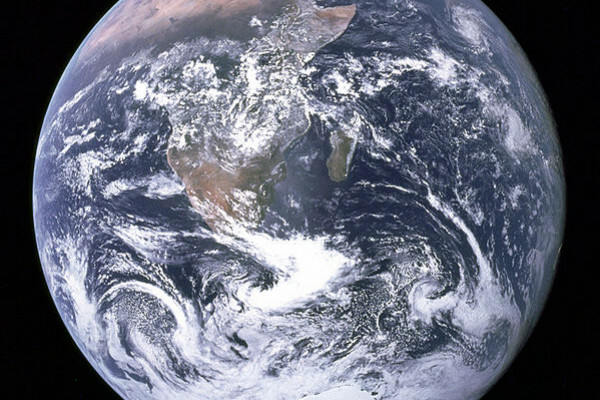 Despite thinking of Earth as a "Blue Planet", models of solar system formation suggest Earth should be much wetter than it is. Now, new understanding of how planets form explain why we're not all underwater. Current understanding of how our solar system formed has planets accreting from a proto-planetary disk of dust and ice, known as a proplid. Within this disk lies a so-called "snow line", where the temperature and solar radiation is sufficient to melt ice and blow away the water. Early on, radiation from the Sun strips electrons off the material, leaving it ionized. This leads to the material falling in towards the star, and heating up in the process, keeping the snow line further out. As the disk runs out of material and cools, the snow line is brought inwards, and models predict that it would have been at around 0.6 astronomical units at the time the Earth formed. We know that objects that formed outside the snow line, like Uranus and Neptune, have vast amounts of water - 40% of their weight, but Earth, at just 0.023% water simply didn't fit. Writing in the Monthly Notices of the Royal Astronomical Society, Rebecca Martin and Mario Livio, from the Space Telescope Science Institute in Baltimore, address this watery mystery. They reasoned that disks around young stars cannot become fully ionized, as there simply isn't enough heat and radiation to do so. This changes the dynamics of the disk, disrupting the mechanisms that lead to debris migrating towards the star, and creating a "dead zone" that extends to a few astronomical units beyond the Sun. The dead zone will increase in density over time, which leads to heating and pushes back the snow line. Dry planets like the Earth can then form within this warmer region. This modified model explains the unexpectedly dry Earth, as well as the dryness of Mercury, Venus, and Mars. It also suggests that an icy ring could form on the inside of a dead zone, from which hot Jupiters could form close to their parent star. This model doesn't apply to every type of star, but helps to fill in our understanding of how our own system evolved. Why do rockets not 'burn up' on the way up?